Southwest Airlines took delivery of the airline’s first Boeing 737 MAX 8. Southwest is the first airline in the United States to receive the 737 MAX, and the carrier expects to take delivery of eight more MAX aircraft in the coming weeks with the intent to launch nine MAX aircraft into revenue service throughout its network on October 1. Southwest’s 737 MAX 8 aircraft feature a single-class cabin configuration with 175 seats, offering 32″ pitch, further enhanced by the modern Boeing Sky Interior; an LED lighting sequence for each step of the Customers’ journey; and, brand new to Southwest, a music-infused Customer Experience onboard all MAX flights with playlists that will run during boarding and deplaning. 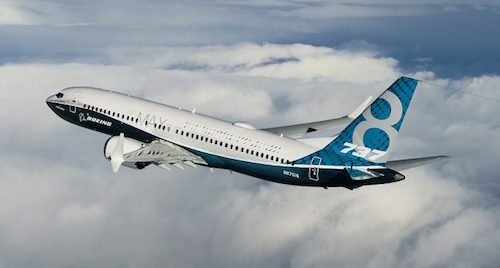 Additionally, the 737 MAX is powered by CFM International’s all-new LEAP-1B engines, which are expected to reduce fuel consumption, emissions, and noise. Southwest served as the world’s launch Customer for the 737 MAX 8 when it announced an order for the new jet in December 2011 and continues a legacy of being the launch Customer for Boeing 737 aircraft series. Southwest has been the world’s launch Customer for the Boeing 737-300, -500, -700, and MAX series of the world’s best-selling airplane. The airline expects to end 2017 with 14 MAX aircraft.